During my last vacation in the Philippines, I had a great time organizing my pantry. 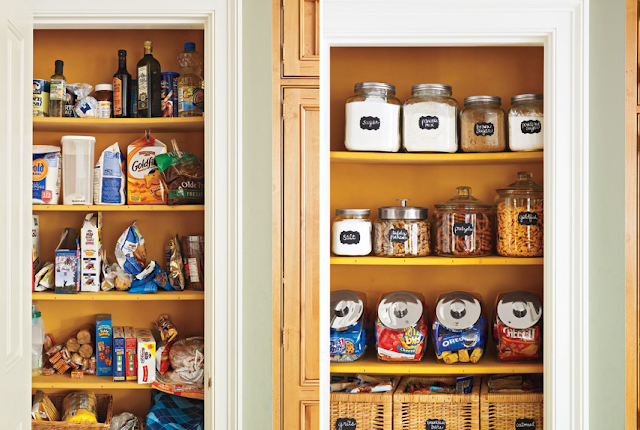 I get inspirations from my previous posts on pantry designs and pantry organization ideas. Although I wasn't really able to do a big make over, I was happy that I was able to have a good start. I bought some small plastic jars of uniform color which I used to store some kitchen stuff like flour, bread crumbs, cereals, sugar, powdered milk, died bay leaves, ground pepper, etc. It works well, as everything looks nice in a row in my kitchen shelf. Now everything gets more visible and easy to find. I bought my cute plastic jars on a cheap price as these were on sale at SM Super Market. It's priced at Php100 per pack of 6. Not bad, huh? Sooner, I will be moving on to the next level ad that's buying some bigger jars with lids to store some snacks like biscuits, candy bars, nuts, pretzels, etc. This way, I can get rid of plastic bags stuck everywhere in my pantry cabinet which tends to look a bit disorganized. See those cute baskets? These can used to store assorted chips, nuts and other items for snack and movie time. I love the jars used to keep assorted biscuits and pretzels. I think, by following this basic organization idea, my pantry would be a lot more organized and it means saving some of your precious time looking for things as everything is now within your reach.